Hey, y’all, I’m going to be on Gulf Coast Live: Arts Edition this Thursday (October 12). My segment will start at 1:30 and run until 2:00 p.m. WGCU Morning Edition Host and Reporter John Davis will be hosting the segment. 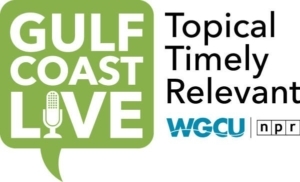 If you not familiar with Gulf Coast Live, it’s a live radio call-in talk show. 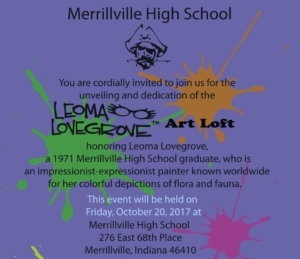 John has invited me to appear on the show to talk about my upcoming trip to Merrillville for Leoma Lovegrove Day and dedication of the Leoma Lovegrove Art Loft. He also wants to talk about your “My Studio” show at the Broadway Palm Dinner Theatre in January, my Hurricane Irma-inspired series, and next Saturday’s Indie Author Day event at Lovegrove Gallery and Gardens. It’s an ambitious agenda for just 30 minutes of air time, but I’ll do my best to cover everything I’ve got going on – not to mention the sort of questions I’ve been fielding from reporters for years regarding my artistic process and inspirations and my philanthropic work. The show is a live broadcast and WGCU’s format allows them to take questions from listeners who call in or who get in touch with the show via Facebook or Twitter as well. I’m thrilled to be on Gulf Coast Live and hope you’ll tune into the show. I’d love to hear from you – either during the show or by posting your thoughts and reaction on Facebook. I promise it will as entertaining as it is enlightening.